SUPERMUN (Suivi de la Performance Municipale) is Burkina Faso’s annual municipal performance survey. SUPERMUN tracks indicators of public service delivery and institutional capacity for the country’s 349 municipal governments (not including the cities of Ouagadougou and Bobo-Dioulasso, which have a different administrative structure). SUPERMUN involves a broad range of government stakeholders: The Direction Générale des Collectivités Territoriales (DGCT) of the Ministry of Territorial Administration and Decentralization (MATD), the Territorial Collectivities Support Program (PACT), the National ICT Promotion Agency (ANPTIC), the Association of Mayors of Burkina Faso (AMBF), as well as the ministries of Health, Education, and Water. Burkina Faso’s major research institutions in the area of local development form SUPERMUN’s scientific advisory board. Indicators of service delivery performance and institutional capacity were developed by REGLAB in 2013/14 form the core of SUPERMUN. 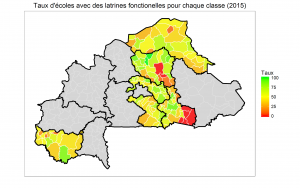 From 2013-16, we collected annual municipal performance data in six out of Burkina Faso’s 13 regions. Building on REGLAB’s initial work, the World Bank and the Government of Burkina Faso decided to finance the nationwide expansion of SUPERMUN and its institutionalization within the government and civil society of Burkina Faso.